At the time of the Spanish Conquest, Quetzalcoatl was known as the plumed serpent god who came from a long tradition of similar representations. 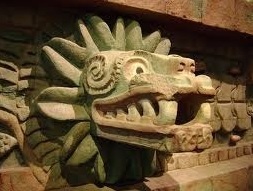 The earliest reference to the feathered serpent deity in ancient Mexico appears in the Olmec times, around 900 BC at the city of La Venta in the modern-day Mexican state of Tabasco. While not as “fleshed out” as the later representations of Quetzalcoatl, the Olmec plumed serpent shows that the iconography of feathered snakes dates back thousands of years. The first major civilization in ancient Mexico to adopt on a widespread basis what has been commonly recognized as Quetzalcoatl was Teotihuacán. 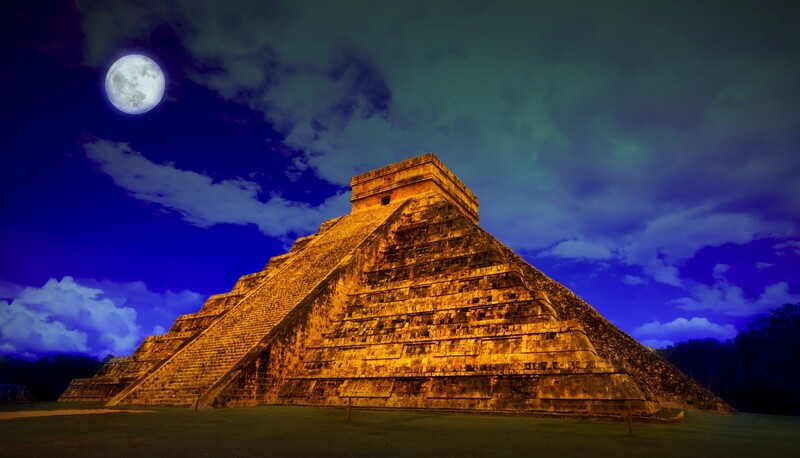 The massive ancient city with its Avenue of the Dead, its gigantic pyramids of the Sun and Moon also had a temple dedicated to the feathered serpent god. The iconic heads sticking out of stone abutments are easily recognizable. As this city-state had no writing system and Teotihuacán collapsed about a thousand years before the arrival of the Spanish, archaeologists and ethno-historians know very little about the feathered serpent god and how it fit into this civilization. It is unclear whether or not this plumed snake deity at Teotihuacán had many or any of the attributes of the later god known as Quetzalcoatl found in other parts of Mexico. With the collapse of the ancient city of Teotihuacán, there existed a power vacuum in central Mexico which would soon be filled by what archaeologists called the Toltec civilization. Like Teotihuacán, the Toltecs had no written language to pass down their stories in written form and their culture was not intact and alive at the time of the Spanish Conquest. Some scholars debate whether or not the Toltecs were an actual civilization and claim that they were more of a legendary people made up to explain the origins of the Aztecs. Through Aztec stories and legends we have some interesting information about Quetzalcoatl in the Toltec era, dating roughly from 900 to 1200 AD. It was during this time when we see Quetzalcoatl being referred to one or more historical figures, and whether or not the person or persons called Quetzalcoatl was actually real is still up for debate. Researchers have to go with Aztec stories about the Toltecs to get any sort of sense of who or what the plumed serpent actually was during this time in Mexican history. According to the legends, the Toltecs were a wandering group before they came down from the north to settle central Mexico, building their first capital city at Culhuacán in the Valley of Mexico. The king who led his people to live a more settled life in the Valley of Mexico was named Ce Técaptl Mixcóatl. When this first king died, his son, Ce Acatl Topiltzin Quetzalcoatl, assumed control and moved the Toltec capital to Tula in the modern Mexican state of Hidalgo. This was said to have happened in the year 968 AD. Quetzalcoatl the man became a religious reformer and was credited with eliminating human sacrifice from religious rituals. He was also the one credited with developing the finer aspects of Toltec civilization. He was the patron of craftspeople, and the best feather workers, metallurgists, sculptors and artisans of all other types were encouraged to come to Tula from all parts of Mesoamerica. As Toltec civilization was flourishing, Quetzalcoatl had many rivals, chief among them was a lord from the north called Tezcatlipoca. In one version of the story, Tezcatlipoca humiliated Quetzalcoatl in front of his people by getting him so intoxicated that he neglected his religious duties and brought shame to the priestly kingship that his father created. In disgrace, Quetzalcoatl left the Toltec capital. What happened after he left Tula is somewhat confusing and there are several accounts explaining the fate of Quetzalcoatl. In one version of the story, he left with an entourage and headed east until he got to the shores of the Gulf of Mexico. When he arrived at the sea he set fire to himself and ascended to the Heavens to become the Morning Star or the Planet Venus. In another version, Quetzalcoatl also made it to the Gulf of Mexico and boarded a raft made of snakes, sailing off to the east and vowing to return. In yet another version, Quetzalcoatl traveled south and east to modern-day Central America. The town of Cuzcatlán, in the modern nation of El Salvador, is said to have been founded by the exiled Toltec king. Some archaeologists theorize that a Quetzalcoatl-like figure may have been responsible for the Toltec influence in the Maya-dominated Yucatán causing the rise of the city of Chichén Itzá. While the connections to central Mexico and the post-Classic Maya are indisputable, it is unknown whether or not a historical figure in the form of an exiled king named Quetzalcoatl is responsible for a Maya renaissance a thousand years ago. The Aztecs were a living, breathing civilization at the time of the Spanish Conquest and because of this so much is known about Quetzalcoatl in an Aztec context, although many competing stories abound regarding this feathered serpent god. This was the nature of religion in central Mexico: although there were many similarities of gods and stories among interrelated tribes and cultures, there was no overarching final authority when it came to religious dogma. Although a few Aztec emperors tried standardizing religious beliefs, almost codifying them into a state religion to be observed throughout the empire, there were many myths and varieties of myths that often opposed one another. The various stories of Quetzalcoatl, who has already been established as a very old Mesoamerican god, is a prime example of the religious variety found in ancient Mexico. Starting with his creation, there are many versions of how Quetzalcoatl came to be. In one version of the story he is one of the 400 children of the snake-skirted goddess Coatlicue. In another version, the goddess Chimalman is the mother of Quetzalcoatl and there are a few stories about how she became pregnant with him. In one story she is a virgin who was impregnated by the god Onteoi while she was dreaming. In another story Chimalman swallows a piece of jade or emerald and becomes pregnant with Quetzalcoatl. That jade story has two versions of its own: in one Chimalman is an unmarried young woman and in the other she is a widow whose husband had passed away years before. In yet another version, Quetzalcoatl is the son of the god/goddess of duality, a vaguely understood deity called Ometeotl who lives in the highest layer of heaven. There are many other legends about Quetzalcoatl’s origins, some very difficult to verify. Quetzalcoatl’s many attributes and functions are as numerous as his birth stories. As the son of Ometeotl, he is one of the lords of the cardinal directions and was assigned to the west. Throughout most of Mesoamerica he is seen as the bringer of light, justice, learning and creativity. He gave the people writing and the calendar. As a just god, he was opposed to human sacrifice, but some accounts contradict this. He is also seen as the protector of butterflies and some researchers believe that this symbolizes resurrection. As the morning star, or Venus, Quetzalcoatl is known as Tlahuizcalpantecuhtli. As the wind, he is known as Ehecatl. In some texts and reference materials these are separate gods, but in many accounts these are just aspects of Quetzalcoatl or forms he may take. In many Mesoamerican accounts Quetzalcoatl is responsible for creating many of the living things we see in our current world, the Fifth World, according to many ancient Mexican peoples. After the fourth world was destroyed, Quetzalcoatl went to the Aztec underworld, called Mictlan, gathered up some old bones, added his blood to those bones and created humans and animals. He also created corn, the staple crop of all ancient Mexican civilizations. High priests in the Aztec world were often given the honorific title of “Quetzalcoatl.” This was also done in other Mesoamerican cultures. It’s evident that there are many confusing and contradictory legends and attributes ascribed to Quetzalcoatl. It is often difficult to cut through the embellishments and re-writings and re-interpretations of the early Spanish accounts to get to the heart of who Quetzalcoatl was. We are left wondering if he was really a man, a god or just a legend. In a way, Quetzalcoatl is much like the Mexican artist Frida Kahlo. He can be many things to many people even well into the modern day almost 500 years after the Spanish conquest. We will now look at 2 post-conquest interpretations of Quetzalcotl that millions of people believe to be true but may have no basis whatsoever in fact or even in ancient Mexican legend. The first is the idea that Spanish conquistador Hernán Cortés was mistaken for a returning Quetzalcoatl and that is one of the reasons why it was so easy for the Spanish to conquer the Aztec Empire. The other is the idea of Quetzalcoatl as Jesus Christ who came to the ancient Americas to spread the gospels after his time was up in the Middle East. The Christ-Quetzalcoatl connection has primarily been promoted by members of the US-based Church of Jesus Christ of Latter Day Saints, more commonly known as the Mormons, since the latter half of the 19th Century. The Spanish conquest of Mexico has long been told and retold, with many twists added to the story, about a handful of Europeans bringing down one of the mightiest empires in the world at the time. We often hear that it was relatively easy for Cortés to subdue the Aztecs owing to the fact that the emperor Montezuma had thought that the Spaniard could have been the returning god Quetzalcoatl and that is the reason why he was so eager to receive Cortés as an invited guest. This idea of the Cortés-Quetzalcoatl confusion has been examined in great depth in recent years. It turns out that there is not a single source from the years immediately after the Conquest talking about Montezuma mistaking Cortés for a returning god. The one source often quoted is the Florentine Codex written some 50 years after Cortés’ first entrance into the Aztec capital at Tenochtitlán. In that document, there is a speech by Montezuma often quoted that the emperor was “saving the throne” for the Spaniard. This has been re-interpreted in recent years as being mere politeness, if the speech ever happened at all. There were no contemporary references to this speech in letters from Cortés to the King of Spain or in the writings of those who took part in the Conquest. Researchers have traced the origin of the Cortés-as-Quetzalcoatl legend back to the 1530s Franciscans who had millennial beliefs and wanted to tie the arrival of the Spanish to the fulfillment of ancient prophesy. This supposed prophesy fulfilment would pave the way for evangelization of the Americas in order to usher in the second coming of Christ. The seeding of the story by the Franciscans may have been a way of making the Conquest more acceptable to the Native peoples and thus make them easier to convert Christianity. In a way, the Franciscan clergymen used the Aztec’s Quetzalcoatl story against them by convincing the generation after the conquest that the presence of the Spanish was divinely ordained according to their own ancient beliefs. When that was written in the 1880s very little was known about the civilizations of ancient Mexico. The science of archaeology had not been invented yet and serious scholarly research into Quetzalcoatl was a century away. The many legends and varieties of legends already touched upon had been floating around for years, with many things added to and embellishing the Quetzalcoatl legend. Many contemporary LDS church members cite some unsubstantiated legends and yet-unproven archaeological evidence when staking their claim on Jesus as Quetzalcoatl. For example, the idea of “the bearded white god,” supposedly, came from the idea that the feathered serpent was really “the bearded serpent” and had somehow gotten corrupted over time. The big problem with this is that no depiction of Quetzalcoatl ever has him with a beard, or looking Caucasian in appearance. He is depicted similarly across time with slight variations. Please go to our slide show on YouTube for even more. Still other groups ascribe other things to Quetzalcoatl. Perhaps he was a reptilian from another dimension, the hollow earth or another star system. Perhaps he was a time traveler or even an ancient visitor from India. New theories and augmentations of old legends seem to pop up every year. While the idea of Quetzalcoatl may seem murky at times and the real story or history may seem impossible to get to, there is no doubt that Quetzalcoatl played a huge impact on the history and cultures of ancient Mexico. Florescano, Enrique. The Myth of Quetzalcoatl. Baltimore: Johns Hopkins University Press, 1999. Porter Weaver, Muriel. The Aztecs, the Maya and their Predecessors. I have done extensive research into human history. I hope to clarify for those whom might want to cut through all of the B.S. that gets smeared around regarding this ‘subject’…. Quetzalcoatl the “Plumed Serpent” (meaning Feathered Snake) is known by several names in different languages spanning thousands of years. His actual name is Ningishzidda, a Sumerian name that is spelled NIN.GISH.ZIDDA and means “The Guardian of the Artifact of Life” or “Lord of the Tree of Life” in Sumerian. He is also known as Thoth or Tehuti/Djehuti in Egypt, Kothar-Hasis in Babylon and many others. He was the designer…”of all the ‘stonehenges’ in Sumer, and South America, and Mesoamerica, and the British Isles, and on the shores of the Black Sea”. Thoth ruled over Egypt until c.3100 B.C. when his brother Ra returned from Babylon, where he was known as Marduk, and deposed Thoth and exiled him to far away lands. At this time the 1st Dynasty was established in Egypt and the Olmec calendar, more commonly known as the Mayan calendar, begins on August 13th, 3113 B.C. Thoth was known as the ‘Feathered Serpent’, was associated with designing the Great Pyramid complex at Giza, astronomy, mathematics and the number 52. Quetzalcoatl was known as the ‘Plumed Serpent’, was associated with designing the Pyramid complex at Teotihuacan and Tenochtitlan, astronomy, mathematics and the number 52. Thoth was also known by Egyptians as Tehuti. Teotihuacan actually means “The Place of Teoti” – not the place of the gods as is commonly claimed. The similarities between the Great Pyramid of Egypt and The Pyramid complex at Teotihuacan have been established by several mathematicians. Thoth designed the Great Pyramid complex after the deluge that was caused by the break-up of the Antarctic ice sheet, circa 11,000 B.C. There are far more parallels, but this should be sufficient for one to began their own research. Or not. Thank you for your comments. There is a lot to look into, that’s for sure.